The text and photos for this unit were developed in cooperation with colonial reenactors during a meeting at Fort Roberdeau, near Altoona, Pennsylvania. The fort is a reconstruction of a fort built on this site in 1780 to protect a deposit of lead which was important as a source of ammunition. 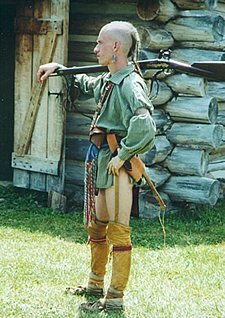 While the positions of colonial, British, and Native American camps are not entirely authentic, their equipment and activities fairly present the customs of the late eighteenth century. This unit has been designed for use by upper elementary and middle school students, especially in their study of Colonial America. Below are some additional ideas you may want to incorporate into your use of this unit. These topics could be the basis for an in-class discussion or a short written assignment - perhaps a paragraph or two. High-ability students may want to do further research on the Web or write a longer paper discussing one of these issues. Stay or Go? - You are a farmer in the Pennsylvania wilderness. You know that British soldiers and Native American scouts are in your area. If you move into the fort, you and your family will be safe but the British might burn your house and barn. If you stay on your farm, both your family and your property might be harmed. What should you do? Whose Side? - The American Revolution has just started. You are a rural farmer. Should you side with the British loyalists or the Colonists who want independence from Britain? What might happen to your farm and your family as the result of your decision? A Day in My Life - You are a child on a frontier farm. Create a project that describes an average day in your life. It may be a piece of writing, a work of art, a song, a poem, or any other project that illustrates how you spend your time during the day.